For the second year in a row, Skittles will sit on the sidelines during the Super Bowl, but that doesn’t mean it won’t be in the game. In lieu of a Super Bowl spot, Skittles will stage a play of its own, a one-night only Broadway musical starring Michael C. Hall (best known for his starring role in Dexter) as the lead. A just released teaser video, with more than 20K views so far, has Hall a bit skeptical about starring in an ad but his psychologist just can’t seem to grasp the concept of the event. The 30-minute show will be performed in front of a live audience at The Town Hall in New York City on Feb. 3 at 1 p.m. The brand is dripping teasers about the event on its social channels—Facebook, Twitter and Instagram—leading up to the show. The theater has 1,500 seats and tickets range in price from $30 to $200. 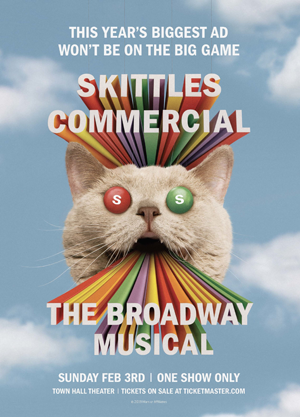 The “Skittles Commercial: The Broadway Musical”, by DDB Worldwide, is written by playwright and Pulitzer finalist Will Eno in partnership with DDB Worldwide. The 17-member cast will also feature original songs backed by a live band. Tickets are on sale at Ticketmaster.com with proceeds donated to Broadway Cares/Equity Fights AIDS—a nonprofit organization that awards annual grants that help men, women and children receive lifesaving medications, health care, nutritious meals, counseling and emergency assistance. 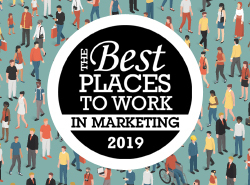 Skittles parent Mars Wrigley Confectionery is donating 100 percent of the purchase price (less any third-party handling, convenience or other fees and taxes) and $25,000 to Broadway Cares/Equity Fights AIDS.